You can work on your existing Create project on a new computer if you bring your media files (the video, audio and image files that you have used in your project) to the new computer and relink them to your project. This is because Create works with your files locally on your computer rather than uploading them. However, if you've only used stock video and audio from our library, then you don't need to bring files with you and can continue working on a new computer straight away by signing in with the same login. Save the files that you used in the project to a USB stick or online storage drive (e.g. Google Drive or Dropbox) so that you can move them to the new computer. Load the files onto the new computer (e.g. drag them to the desktop or download them to the Downloads folder). Open Chrome and log in to Create with the same account you used when creating your project. 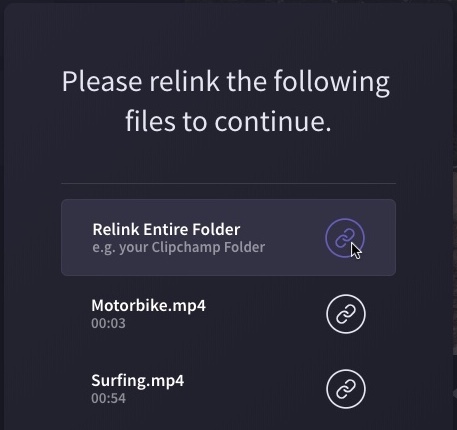 You will see a message prompting you to relink your files. Click on it, then click Relink Entire Folder, find the folder with your media files on the new computer and click upload. Alternatively, click on each file and locate and upload them one by one until all files are relinked. Once all the files are relinked, the window will close and you should be able to continue editing your project on the new computer. In the future we plan to add options for cloud storage that will make working on different computers or sharing your project with team members easier.